"It is the People That Make the Difference"
We value long term relationships over short term profits. We value the concerns of individual citizens as key representatives of our municipal customers. We are dedicated to improving the quality of life of our employees through adequate wages, health care, retirement benefits, disability benefits, and a healthy working environment. We seek to provide a workplace that encourages creativity, innovation, continuing education, and the personal development of our employees. We strive to provide a safe and hazard free working environment for our employees and customers. We believe honesty and integrity are the most important elements of every business decision. We believe it is important for the company to earn profits sufficient to provide for its future growth and stability. As the grandson of Harry F. Hall and son of Harry L. Hall, Doug is the third generation owner of Musselman & Hall. Doug was born and raised in Raytown, Missouri and began working as yard boy for the company in 1957 at age 13. After two summers in the yard he moved into the field in 1959. He worked summers in the field as a laborer, form setter and labor foreman until he graduated from the University of Kansas with a Bachelor of Science degree in Civil Engineering in 1965. Upon graduation he joined the company full time until he joined the United States Air Force in 1967 to serve in the Vietnam War. He achieved the rank of Captain and served as the Chief of Operations and Maintenance for the Base Civil Engineer at Columbus Air Force Base, Mississippi. Doug was discharged from the Air Force and rejoined M&H in 1971. At that time he moved into management and was immediately given the assignment to start the slurry seal operation. He is a registered professional engineer in Missouri and Kansas. He became Chief Executive Officer when Harry L. Hall passed away in 1978. Doug’s wife, Judy, served the company as Chief Financial Officer from 1983 until she retired in 1999. After 104 years as a family-owned company, Doug assumed the position of Board Chairman on July 1, 2018 when Musselman and Hall contractors restructured as an employee-owned company. 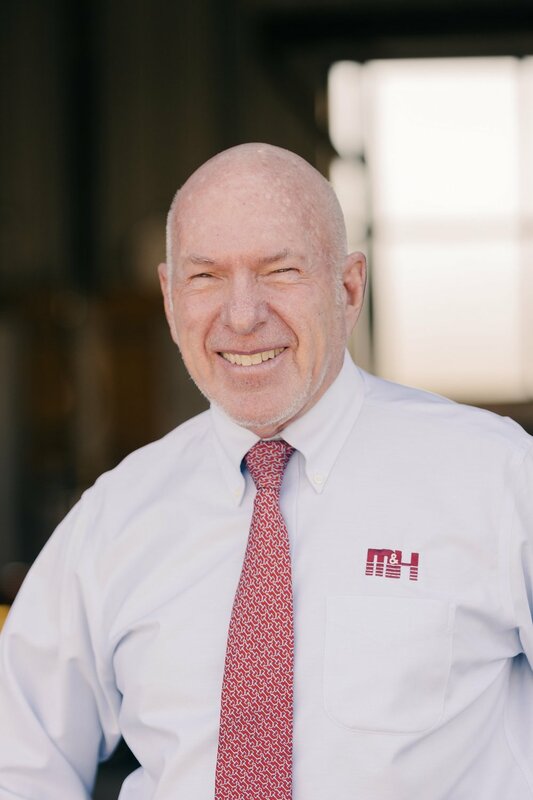 Mike Morris began his employment at M&H in 1973 at the age of 15. His father Carl and uncle John were M&H superintendents since the early 1950’s. Mike began as a laborer but has served in many capacities until he acquired an ownership position in 1994. He is a graduate of the University of Missouri and a registered professional engineer. His primary responsibility is the management and coordination of all M&H concrete work. Dexter was born and raised in St. Louis, MO. He moved to Lawrence, KS in 1993 to pursue a degree in business administration at the University of Kansas. During his time at KU, Dexter began working part time at Musselman & Hall. Upon graduation in 1996, he moved to Kansas City to continue his career at M&H. Dexter continued his education and received his masters in business administration in 2000. Dexter managed all of architectural concrete operation of Musselman and Hall including: colored concrete, stamped concrete, polishing concrete, and concrete toppings, from 2000-2011. In 2008 Dexter became part owner of Musselman and Hall and in 2011 assumed the role of Executive Vice President. On July 1, 2018 Dexter took on the position of CEO as Musselman and Hall became an employee-owned company after 104 years as a family-owned business. All construction contractors buy the same materials and machinery. It is the people that make the difference. Our business is built on customer satisfaction that leads to repeat business. People call us back, not because we have great machinery, and we do, but because they trust our people. Our customers know we stand behind our work and they know that we are completely obsessed with customer satisfaction.